Join us in celebrating the World Fisheries Day! 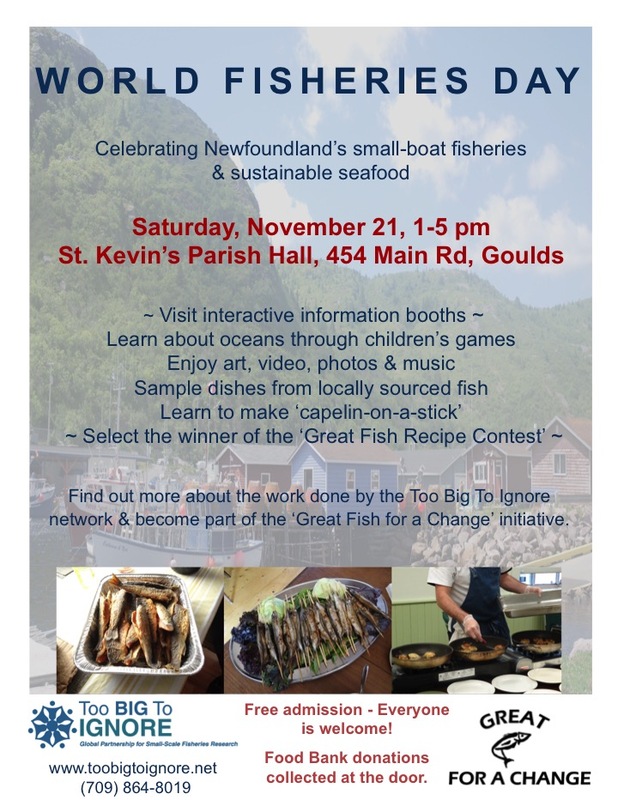 This year TBTI plans to celebrate the World Fisheries Day, November 21, with a family and community event to be held at St. Kevin’s Parish Hall, Goulds, Canada, from 1-5pm. In the first half of the event (1-3 pm), we are setting up interactive information booths, art exhibition, video displays, and children’s games, to promote learning about marine resources and small-scale fisheries. The second half of the event (3-5 pm) will present highlights from the TBTI ‘Great Fish for a Change’ province wide community events. Audience will also have a chance to see a cooking demo of a capelin-on-a-stick and taste several other fish dishes. We will also organize a ‘cook-off’ of the three best dishes selected through the ‘Great Fish Recipe Challenge’. Throughout the event, special focus will be put on celebration of Newfoundland's small-boat fishery, its tradition, viability, and future opportunities. Learn more about the work done by TBTI, its members, partners and friends in connection to our fisheries and oceans and show your support for the viability and sustainability of small-boat fisheries in Newfoundland. Spread the word about the event (#WorldFisheriesDay) and encourage others to participate. Let’s make this day a true celebration of small-boat fisheries!